The MBOX File Office 365 migration software can move complete emails with attachments to Office 365 accounts. It is a secure and safe way to export emails without any data loss. The software ensures that email data integrity and security is maintained. No personal email information is used by the software or shared with a third-party for promotional purposes. 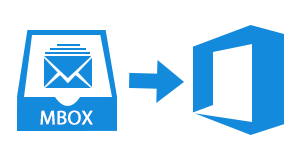 Use the MBOX to Office 365 conversion tool to move multiple .mbox files in bulk. There are two modes of import MBOX file. 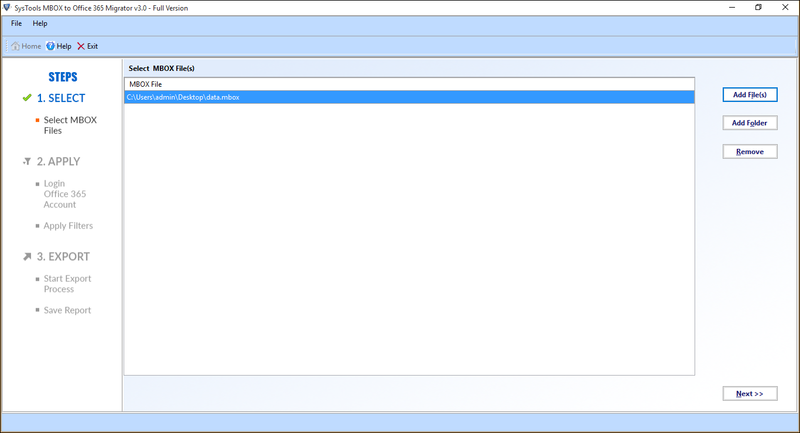 One is the Add File method to import single .mbox file one at a time. Use the Ctrl key to select multiple .mbox files in one go. The other option is the Add Folder option, that helps import a folder containing multiple .mbox files. The tool is powerful enough to repair any minor corruptions in the MBOX file. It can recover any missing or recently deleted emails from a corrupt/damaged/infected/erroneous MBOX file. It then converts them and uploads MBOX folders to Office 365 mailbox. The tool works with .mbox file from different email clients like Thunderbird, Apple Mail, Eudora etc. 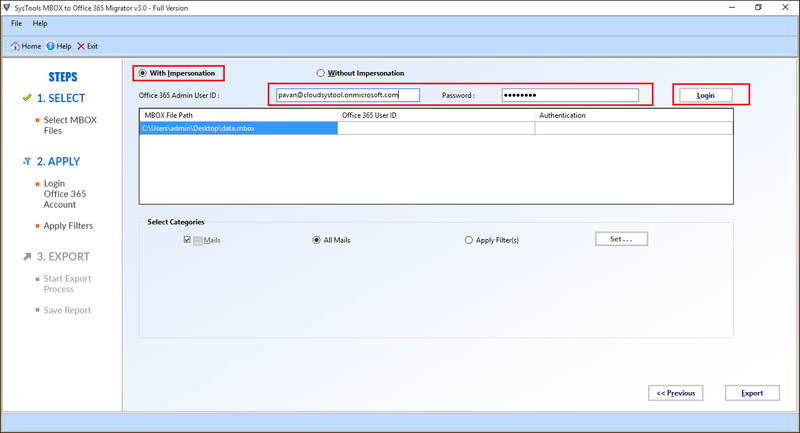 Impersonation method allows an administrator to access multiple Office 365 accounts within a single domain. 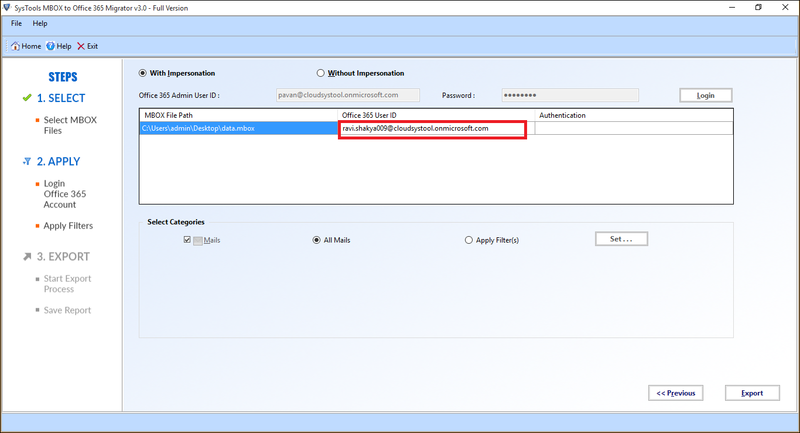 Import MBOX file to Office 365 mailbox using the Impersonation method provided by the tool. Single Office 365 mailbox owners can forgo the Impersonation method and migrate MBOX folders to office 365 account directly. Mozilla creates a sub folder file by the extension .sbd. Convert SBD folders to Office 365 accounts using the MBOX Office 365 Converter. The tool can work with all latest versions of Windows including Win 10/8/8.1/7 and Vista. All it requires is Office 365 administrative credentials or login details of the individual mailbox. There is an option in the MBOX Email Office 365 Converter to selectively convert emails using a date-based filter. Set a ‘to’ and ‘from’ date and emails will be transferred that were received in this time period. This option prevents any needless conversion of mailbox data and saves time in moving large .mbox files. There is an option provided by the tool to choose between keeping the folder structure intact in the exported emails. Remove maintaining folder hierarchy for output emails in Office 365 account by just a click of a button. By default, the MBOX Office 365 Converter ensures that the folder structure is maintained. The MBOX File Office 365 Converter is a reliable and relevant tool. This is could be said as the tool generates a complete live status report during the transfer process. 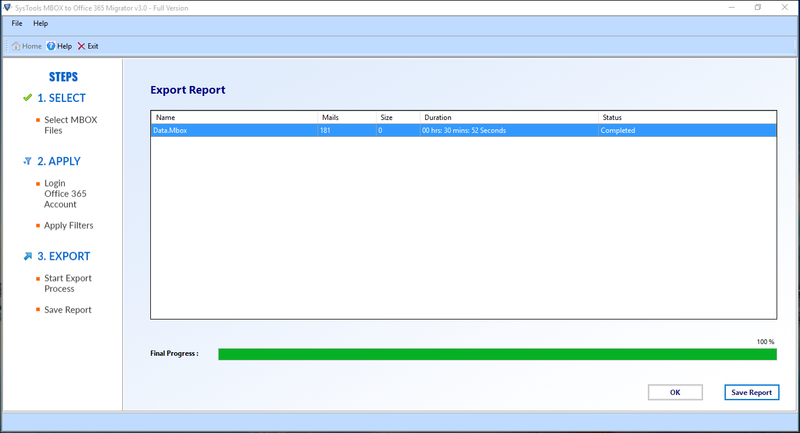 A complete export progress report is also generated that can be saved anywhere on the machine. A CSV report created at the end of the migration process can be used for future reference purposes. Is there a need to have MBOX email client to be installed on the migration machine to use this tool? No, MBOX supported email client is necessary to be installed on migration machine to export MBOX emails to Office 365. My Inbox folder is saved in an in.mbox file. Do I use the folder option or the file option? 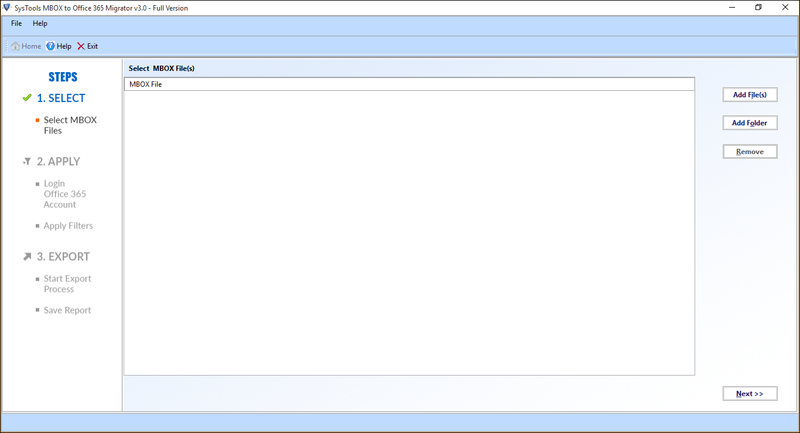 Use the Add File option to upload in.mbox directly to Office 365 account. Is there a way to convert emails that have been recovered using the MBOX Office 365 Converter? Yes, the tool supports conversion of recently recovered emails using the tool. Can I migrate Thunderbird email to Office 365 using this software? Yes, just export Thunderbird mailbox to a .mbox file. Then, import the file on to the tool and converts it to Office 365 emails. Are the emails transferred along with proper formatting and email attachments? All emails are converted keeping the email attachments and doc links intact. The tool also ensures that the email formatting is not affected during transfer. First, Download and Install the MBOX to Office 365 Converter. Launch the tool from its default location in C:\Program File. Next, click on following two option to import MBOX file into the tool. Add File: To import single MBOX file at a time. Add Folder: To import multiple .mbox files contained in a folder. Having imported the MBOX file into the tool, click on the Next button. 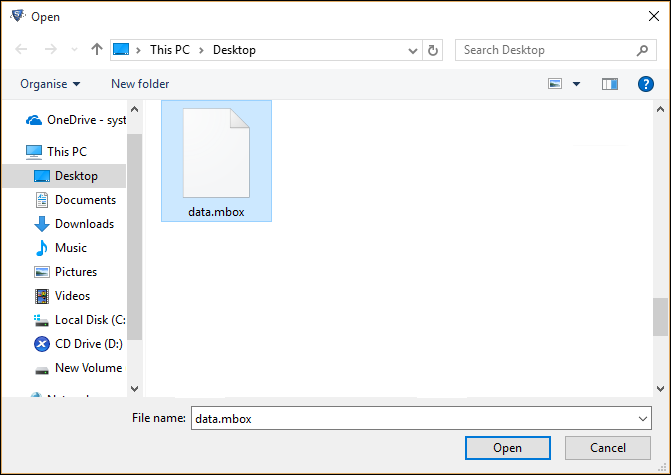 Next, Browse to the folder location where the MBOX file is saved. Now, the MBOX file will be shown in the tool as in the image below. Then, click on the Next button to proceed to the next step. Now, an Export Options dialogue box will appear. From here, one can select to forgo Folder hierarchy in exported emails. Next, click once on the With Impersonation radio button and the following window will appear. 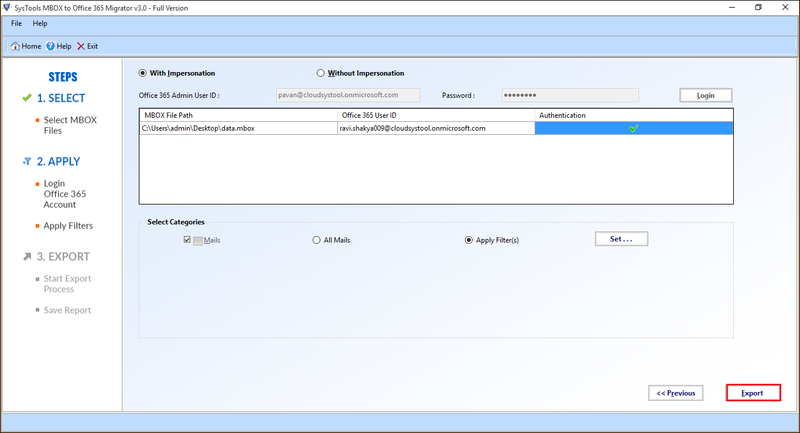 Enter the Office 365 administrative credentials to start the MBOX to O365 migration process. Having done that, click on the Next button. Now, the authentication process will start. 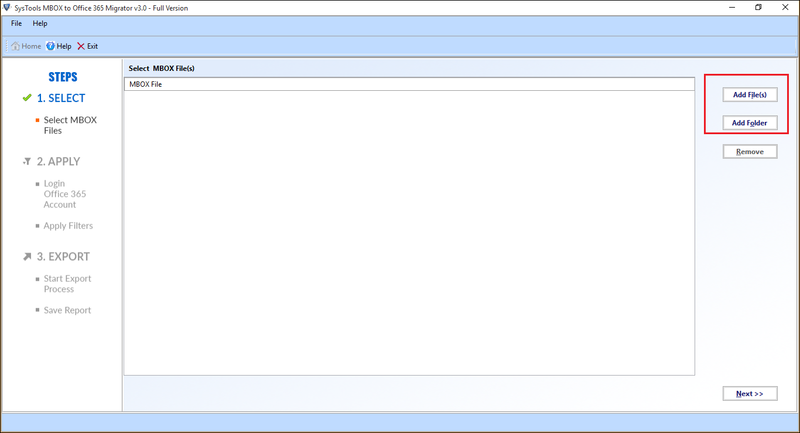 Now, all the mailboxes under the Office 365 account will be displayed in a list on the software interface. Once the authentication is complete, a tick sign will be shown as in the image below. From the Select Categories section, click on the Apply Filter(s) radio button for applying a date-based filter to emails. Click on the Set.. button to selectively migrate MBOX folder data. Then, set a ‘to’ and ‘from’ to limit email conversion to a specific time period. Click on Apply button after having set the Mail Date Filter. Note: This filter is only applied on the ‘Received Date’ of emails. 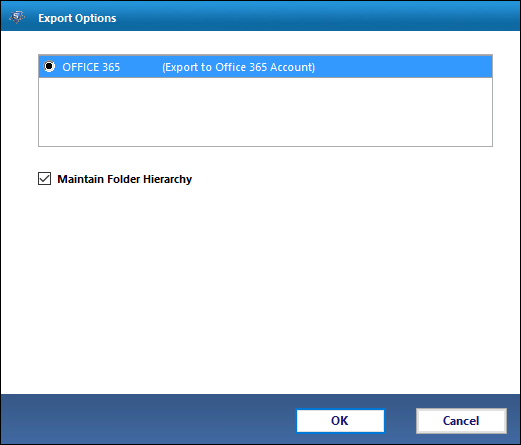 Now, start the MBOX to O365 conversion process by clicking on the Export button. After the migration process has been initiated, a live progress report of the MBOX to O365 migration process will be displayed in front of the user. This will contain the MBOX file name, email count, the file size and time duration passed with a progress bar. Next, a message box will appear indicating the completion of the process to migrate emails to Office 365 accounts. Once the export procedure gets completed, a complete report is generated. 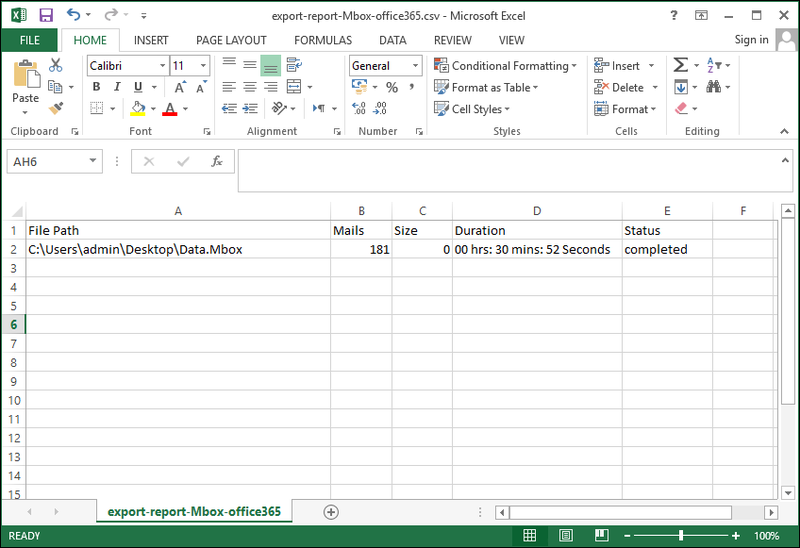 This export report contains necessary information regarding email count, the file size, time duration and status. 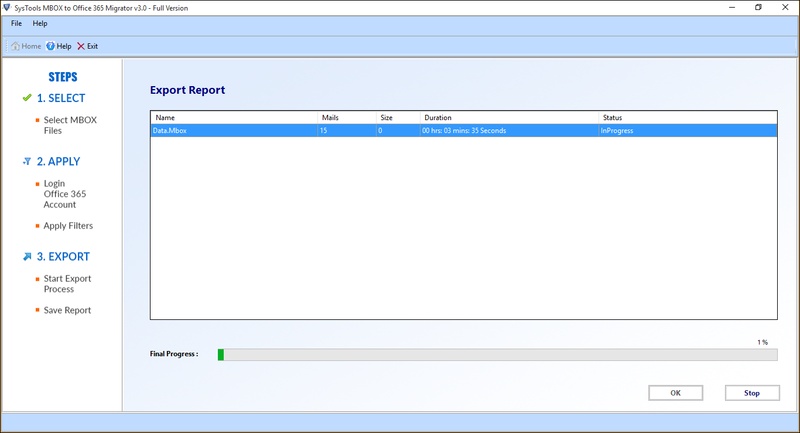 To save this report on a folder path anywhere on the migration machine, click on Save Report button from the bottom-right corner. 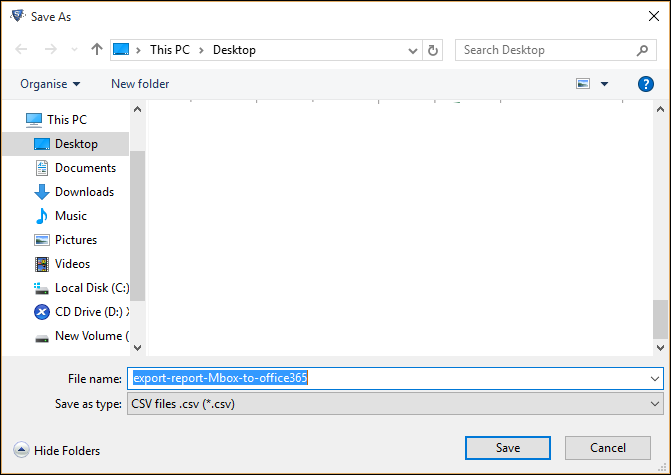 Next, Browse to the folder location to save the CSV report. Find the location and click on the Save button. This will save the CSV report in the desired folder path. A message box will appear indicating successful save process. Now, go to the folder location where the CSV report is saved. 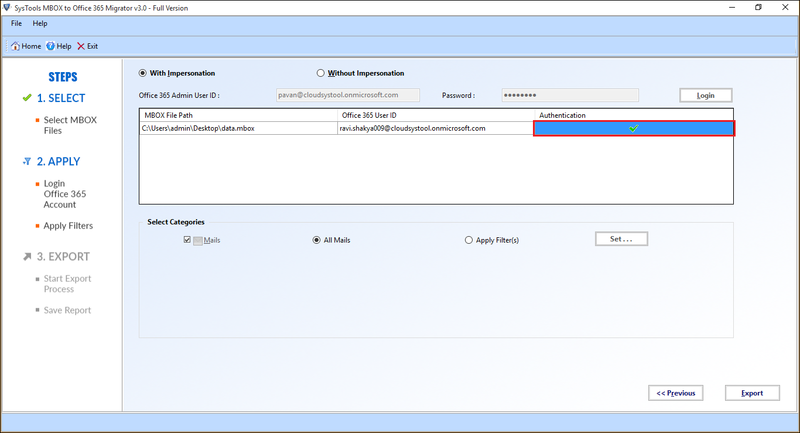 Open the file to check the details of the MBOX email to Office 365 conversion. 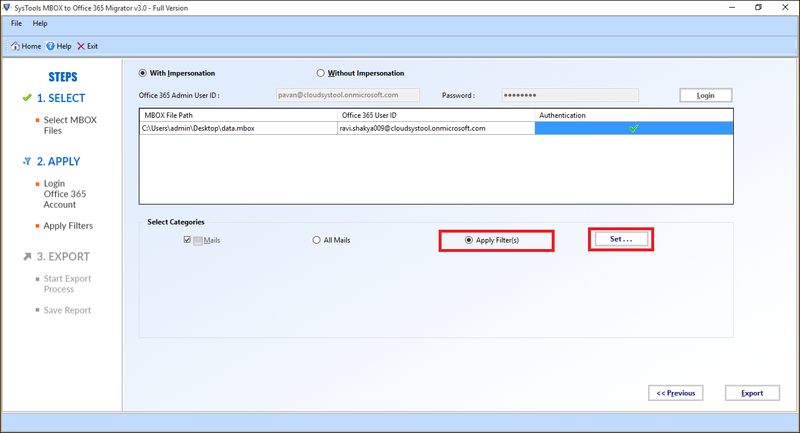 Finally, verify the successful migration of files by checking the Office 365 mailbox. "The MBOX Email Office 365 migration tool is a great software. It helped me migrate multiple .mbox files in one go. I could even limit mailbox conversion for large MBOX files that were taking a lot of time. I purchased the full licensed version and appreciated the help I got from the support team in using the software. I will definitely recommend this to all my office staff." "My Thunderbird emails were stuck in an old .mbox file that I had not used in years. I was sceptical on importing MBOX file into the tool as most of the data was damaged. The tool successfully repaired my corrupt MBOX file and recovered my damaged data. I was able to successfully move Thunderbird email to Office 365 with ease. Thank you!"